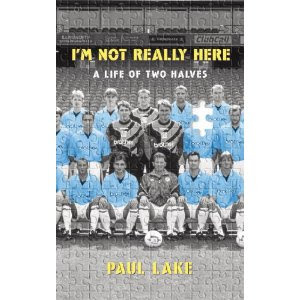 Paul Lake was Manchester born, a City fan from birth. His footballing talent was spotted at a young age and, in 1983, he signed coveted schoolboy forms for City. Only a short time later he was handed the team captaincy. An international career soon beckoned and, after turning out for the England under-21 and B teams, he received a call-up to the England training camp for Italia '90. Despite missing out on a place in the final squad he suitably impressed the management, with Bobby Robson earmarking him as an England captain in the making. As a rising star Paul became a target for top clubs like Manchester United, Arsenal, Spurs and Liverpool, but he always stayed loyal to his beloved club, deeming Maine Road the spiritual home at which his destiny lay. But then, in September 1990, disaster struck. Paul ruptured his cruciate ligament and sustained the worst possible injury that a footballer can suffer. And so began his nightmare. Neglected, ignored and misunderstood by his club after a career-saving operation was irreversibly botched, Paul's career began to fall apart. Watching from the sidelines as similarly injured players regained their fitness, he spiralled into a prolonged bout of severe depression. With an enforced retirement from the game he adored, the death of his father and the collapse of his marriage, Paul was left a broken man. Set against a turning point in English football, "I'm Not Really Here" is the powerful story of love and loss and the cruel, irreparable damage of injury; of determination, spirit and resilience and of unfulfilled potential and broken dreams. I have virtually no interest in footballing autobiographies, but this one is special to me. As a young Wrexham fan in the early 1990's my absolute favourite players was a long-haired, impossibly skilful, and wonderfully charismatic player called Mike Lake. On loan from Sheffield United during the 1992-3 season, he came for 13 games, took us from mid table to 3rd place, and then got recalled to Sheffield. Ex-Liverpool legend Jimmy Case replaced him for a match - and we crashed out in the most welcome defeat of all time, as our shambolic midfield performance in that game made it clear that we needed the maestro back; money was found from somewhere, and Mike signed permanently to help lead us to promotion. Sadly, that one season was pretty much it as far as ML was concerned - injuries blighted the rest of his career and he retired a couple of years later after never recapturing the form of that golden year. Just as sadly, his brother Paul, generally recognised as one of the brightest English prospects of the late 80's or early 90's, also had a hugely promising career cut short through injury. This is Paul's story - and from everything I've seen about it so far, it looks set to stand out a mile from the usual bland superstar autobiographies.